Oh, lovely May is a horrible month for a blogger – so much life to live and so little time free to write about it! 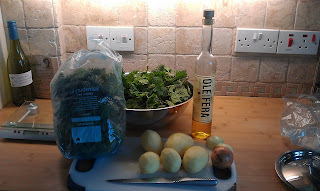 Here I am half way through May and still writing about April’s wild food experience. I’ve been busy though, accumulating topics and stories to write about! So, April brought our fourth “wild food from the park” opportunity. 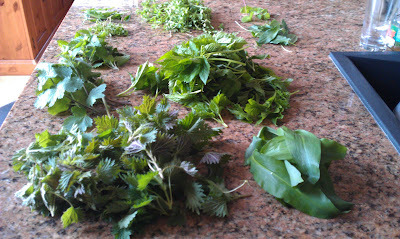 March had offered us an improvement in the diversity of our “park-based” diet, with the appearance of nettles, but April, oh April was a joy – buds burst, leaves unfurled, flowers flowered and the sun, the weeks of wonderful hot sunshine warmed up the vegetation and made it smell all green! 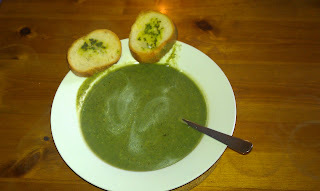 We were stuck for choice about what to make from all the newly-appeared edible plants, so we made it all! And, joy of joys, in April, following a hunch about the likely location of some suitable habitat, we tracked down a big patch of ramsons or wild garlic growing in a secret, secluded and difficult-to-reach corner of the Park. People keep asking me if I’m worried about eating wild leaves that “dogs could have peed on” – as if the vegetables they buy in supermarkets don’t grow in fields, exposed to the unobserved attentions of wildlife. So, here, for the benefit of those folk, is a picture of the nettles being washed – yes, we do wash everything first! – a handful of wild garlic leaves in the food processor with a pack of butter and blended until completely mixed. Garlic bread was then made in the usual manner, but with this butter mix. Delicious! A week or so later, yet more edible plant species had popped up in the Park. 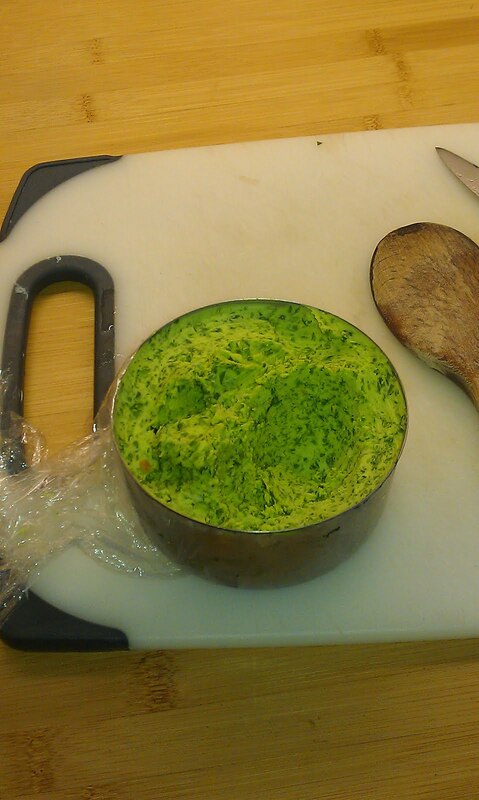 Our first really ambitious attempt of the year was a wild Spring greens soufflé, based on a recipe in the book “Seaweed and eat it” by Fiona Houston and Xa Milne. This was also the first soufflé I have ever made (real men do eat soufflé, you know!). 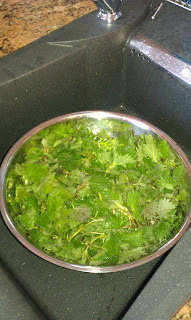 We picked a range of edible plants: nettles, white dead nettles (Lamium album), cleavers, ground elder, dandelion and chickweed. 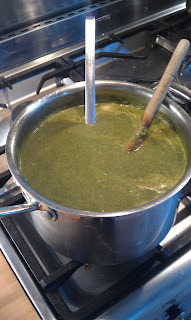 From the following photo, you can see that the nettles and ground elder formed the bulk of the veggies. The leaves were washed, steamed until tender, fried with onion, and then mixed in with beaten egg yolks, before folding in stiff, whipped egg whites. All of that was poured into a greased casserole dish, parmesan grated on top and then the lot was baked in the oven. Coached by the lovely O, I resisted the urge to open the oven to see the souffle rise. And so it rose. 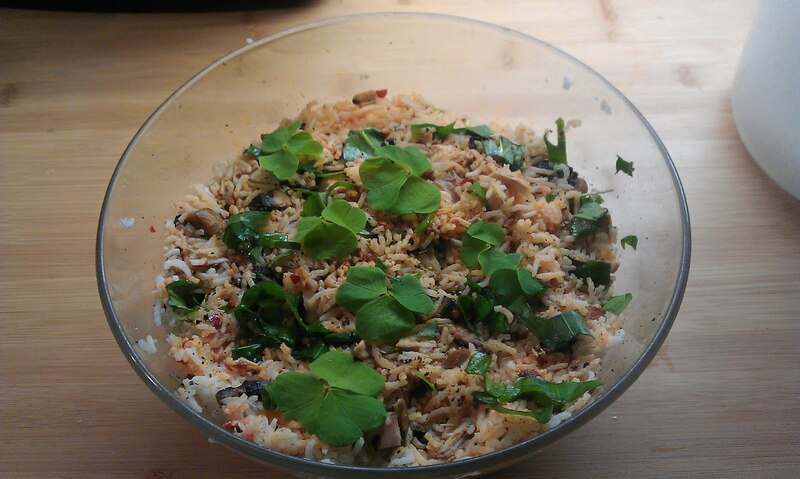 We also picked some wild sorrel and sliced that up, along with wild garlic, to add to a chicken and rice salad, which we garnished with some edible, vinegary, clover-type leaves of wood sorrel. 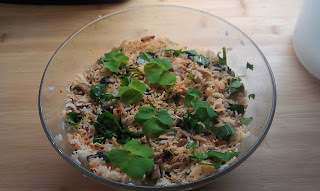 We served the two together, rice salad and soufflé. ﻿ Another delicious wild food combo! The soufflé was dense, very green and actually tasted like it was based around interesting-tasting spinach. 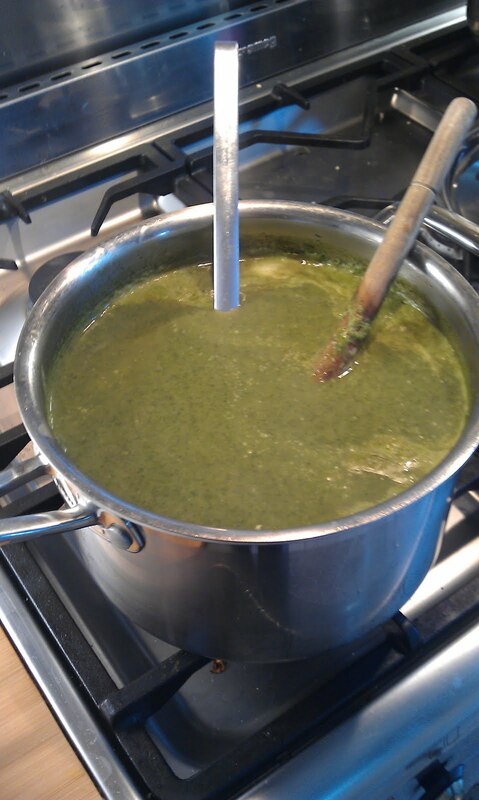 Ground elder, a key element of the soufflé, is an under-rated food plant, despised by gardeners as an über-invasive weed in gardens that is incredibly difficult to eradicate. It was, however, apparently introduced into Britain by the Romans (what did the Romans ever do for us, eh?) and is really quite tasty and nutritious if eaten while young and tender and treated like spinach. 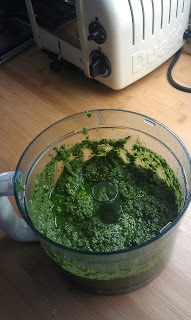 We’ve eaten it a couple of time on pasta and it is much more interesting than boring old shop-bought basil pesto. 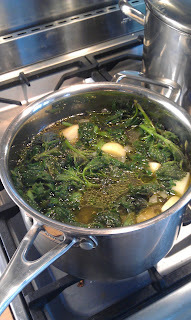 It is preserved in the fridge, submerged under olive oil in its jar. Good to see you back. Been a while.